Verified, a .dll is missing from the .zip file, “LIBEAY32.DLL”. It might be included in the older 3.10.0 bfgminer for gridseed .zip, I’m going to look now. This package has a few missing libraries in it and also doesn’t seem to work with GPU mining – it just disables the gpu’s and if you try to look at them in the manage devices menu the miner crashes. Download again, the missing libraries have been included. The miner does support GPU mining for Scrypt, but by default the command line disables the GPU and runs only on Gridseed, if you want to enable OpenCL GPUs as well remove the -d parameter from the command line. 1)Is such speed for overclocked gridseed asics? 2) What overclock was apply? Could you give me link for detailed FAQ. 3) Bfgminer would be work on raspberry? admin, thank you very much! keccak, with the voltmod you would be able to achieve higher operating frequencies with the device working properly. something is not right admin have you looked at this more than once, anyone get it running ? admin ok thanks going to try it now again and report back…..
sonny, are you getting this every time a few seconds after the software starts working? admin yes when i try to start it i get it right away it crashes does not tell me why windows just searches for a error and does not find it..
Is there a limit of 10 Gridseed with bfgminer? I can only get 10 to run. If not, what am I doing wrong? Running fine for me after loading LIGHTNINGASIC Gold miner USB driver_V1.3.1. Just won’t run more than 10 units. does this require another driver instead of windows usb driver? For people that are having problems with the new release, try running the miner with just a single device connected to see if it works properly that way and then with all of the devices plugged in. You can remove the -d command line parameter so that it will run on GPU as well (if you have any on the system running the Gridseeds) or try stopping another miner instance that you use for GPU mining. Alternatively you can revert back to the previous 3.10.0 release if it is working fine for you or try the latest cgminer if you need the extra frequency options. Unfortunately we do not have more than 10 miners to test with, but it could also be that bfgminer does not show all of the devices, but they are actually detected and working, you can easily check that if you look at the poolside reported hashrate. This new build gives the appearance of working with 5 gridseeds but: two oddities #1 it shows 6 gridseeds (0,1,2,3,4,5) instead of the connected 5 gridseeds. The imaginary sixth doesn’t hash – just gives “unexpected responses”. 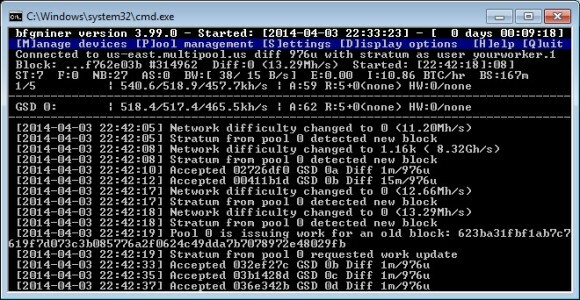 #2 maybe a real problem, the pool reports satisfactory hash rate but no shares. Has anyone confirmed they are actually generating shares and not just hashrate? Miner, if you are seeing hashrate reported by the pool then the miner should be sending shares… pools calculate hashrate based on the number of submitted shares over a period of time. It is another thing if you are only seeing local hashrate and nothing poolside… we’ve had this problem with an older Gridseed miner using CP2102 USB to COM. You’re right. On my second test I see new shares on the pool. I was ready to report no shares again after 7 / 8 / 9 minutes but then after 10 minutes shares showed up on the pool. It’s a pool delay I guess. I can’t get pass RED letters saying NO DEVICES FOUND Press ‘M’ and ‘+’ to add ?????? Is the -S and -D in the batt file need to be edited. If so what do I put there? Dave, have you used cgminer before with WinUSB drivers installed, if so you need to revert back to the standard COM drivers in order for bgfminer to detect and work with the miners. With the default command line parameters it should detect and run on all Gridseed devices it can find, so apparently bfgminer is unable to find the miners. yes I have no problem using cgminer. Dave, you need to remove the WinUSB driver and get back to the standard one that uses direct COM port addressing in order for bfgminer to detect and work with the miners. The WinUSB driver is needed only for cgminer. admin thanks for all the help!! You guys are really a wealth of knowledge, and do things FAST!!!!!!! Dave, from the device manager choose to update the driver and manually select the STMicroelectronics Virtual COM Port driver. Alternatively you can just install the driver and instal again the STMicroelectronics Virtual COM Port driver software. admin still a no go :( same msg as before on bfgminer. and now my cgminer wont work. I really wanted bfgminer to work for me it seems to have a better user interface. I’ll keep trying. admin 5000.000 Doge coming at ya! Have you guys looked into the power usage on the gridseed with this new BFGminer? Also can it dual mine? Gotta win you over to the dual mining side admin. Every time I do the math dual mining comes out slightly better than LTC only mining. Typically 11% better for me after factoring power costs. It’s 12% today. I use this calculator http://www.coinwarz.com/cryptocurrency/?cal=1 and plug in my actual numbers from my pools and the power consumption measured at the wall outlet. I’m not interested in volt modding at this point. I have to agree with Miner, I am personally fond of the dual miner mode. I play around with some alt coins that give me a $$ boost all be it small but adds an extra dime or two here and there. For the clock setting, can I target specific units by serial number? GolfCabalist, no bfgminer does not yet support that feature. Admin, is this bfgminer working with the latest voltmod (1x49k replacement)? Thanks. Christian, yes it works with voltmodded units. trip, the authors of BFGminer are working on improving support, but it will take some more time. Is there a way to auto-revive frozen gridseeds? Every night one or two of my devices will not share anymore. Christian, resetting the USB ports might help (disable/enable from the Device Managed for example) or physically unplugging/plugging, though sometimes you need to cycle the power of the device and not just reset the USB port. Disconnectiong the power is not possible for me because they are connected to my mining rigs power supply. Any the power is only cut if i shut it down, not only by a reboot. Im mining with 6 GTX750Ti and 10 Gridseeds. Bit first ill try the disable port trick every 6 hours. This version is very unstable. 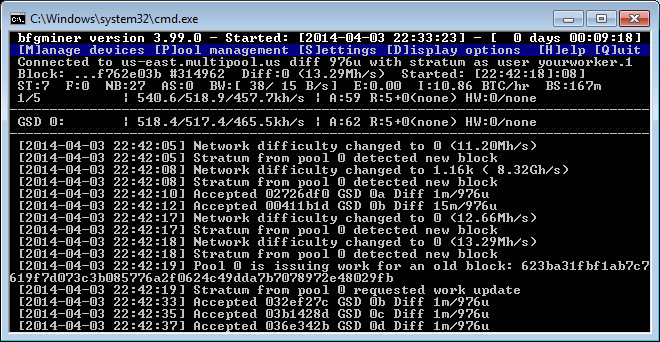 It seems to stop accepting shares after an hr or so and I have to restart bfgminer. It works great while its running so hopefully they can fix some of the issues with it soon. Just finally caught this news. The download works fine for me in MultiMiner. Just dropped the files into the 3.10.x build you provided previously in the bfgminer/ directory of MultiMiner. Started it up, and hashing away. I can only get up to 825MHz from a stock device, but better than the 800MHz that was last stable, for me. There’s a threading issue or such with this build. In sha256 or scrypt mode, it’ll occasionally go 100% cpu between 5 min to 30 min after start-up. I had to roll the BTC miner every 30 minutes, so I went back to 3.10 for that. For scrypt, I already roll it often for different coin strategies, but it also still goes 100% cpu when given some rope. Can you make a more recent build with these issues probably fixed? Thanks! How can i select a single com port or com port range in bfgminer 3.99? I need this because i have gridseed single miners and blade miner running. the different freq they use.